We have a 50 ton travelift that will haul vessels with up to a 22 feet beam. 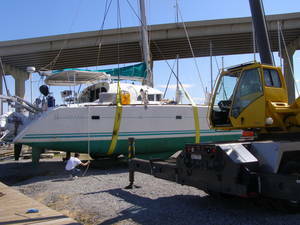 A crane service can be used for some boats and we have the yard space to house them. We welcome customers that may want to work on their own vessels. Rules and regulations apply and are strictly enforced. Turner Marine specializes in yacht grade quality repair in all facets of yacht maintenance. See our "Marina Yard" section for more details.